Innovative triple-weave construction helps block out light, outside noise and insulates against heat and cold cutting back on window related energy loss.Independent laboratory tests show curtains blocks out 99% of light and 100% of UV rays. Darker colors are more effective in blocking out light. Machine wash warm with like colors. Use only nonchlorine bleach when needed. Tumble dry low. Warm iron as needed. CREATE PRIVACY IN MINUTES - Our Premium Heavyweight Room Divider Curtains significantly reduce light to maximize privacy. Feature: Blackout; thermal; the front and back are same color and hand feel; matt finish. Brings you luxury curtains at an affordable price. Super soft thermal insulated blackout patio door curtains in the New Sandwich Technique that will enable to block out 99.8% of sunlight. It Blocks out light and noise while cutting back on window related energy loss. 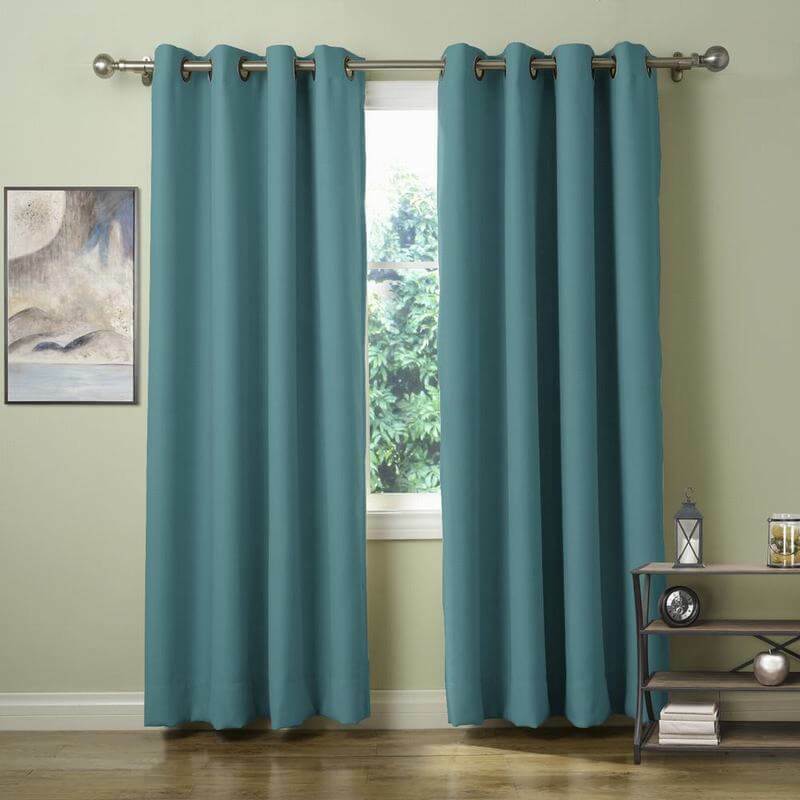 Practical and functional, these curtains are machine washable and easy to care for. 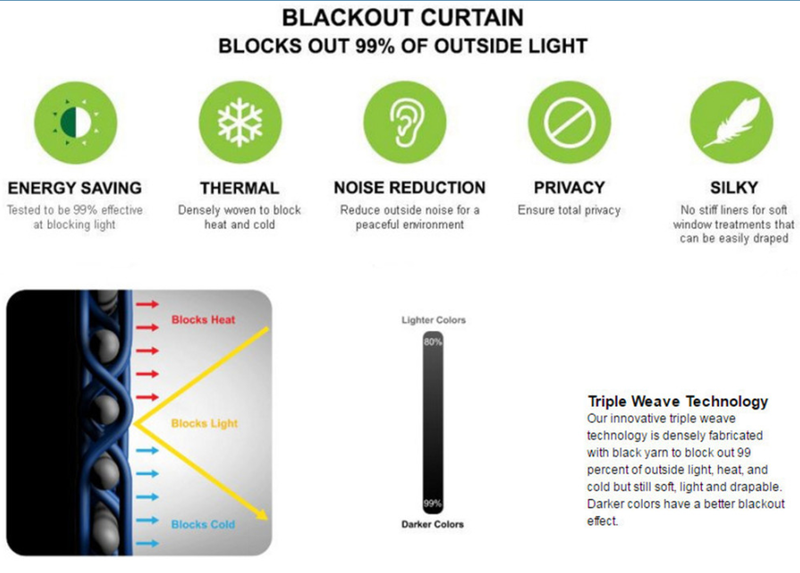 Blackout curtains are ideal for: Late sleepers, Grave-yard Shift workers, Infants, Parents, Students, Computer operators. French doors are a gorgeous asset in any room, so make sure you give them the attention they deserve. Ensure curtains are thermal-backed; French doors tend to let more heat and cold inside due to the amount of glass. Here, draw the thick curtains to cover the windows and doors to create a cohesive look. 3.Protects your indoor furniture from direct exposure to the sun. 4.Specific for : Late sleepers, Shift workers, Seniors, Infants Parents, Students, Computer operators. This is a really soft drape that blocks a lot of light. I put a flashlight behind it and only a little bit of light came through. This is a really good blackout drape. I am absolutely in love with these curtains. They are a great material, and they really do block out the light without being ugly or thick. Definitely not blackout. But they look soooo good! Absolutely worth the price. Look high quality! A relative came by after I hung them and had me order her several panels! I have double windows (so two 32” windows stuck side by side) and I needed two panels to cover it. Whereas with standard size panels I would’ve needed 4. Cannot rate these highly enough! I know that these are meant for the patio for the most part, but i ended up using this alternatively as a divider for the garage to have more darker room for entertainment purpose as i have a projector there and this darkens the surrounding even better to get a greater picture. I will def recommend these for someone who needs a long and wide curtain. I got the grey option as i felt it would be easier to clean off any dirt off. These are great blackout curtains. Are long which is a plus. I have 9 ft ceiling and these cover all top to bottom, would recommend. Great quality!! Insulates vey well! I live in a railroad apartment in a city, so we don't have much in the way of doors (each room is connected by an archway). I first purchased this curtain two years ago to separate our kitchen from our bedroom. It's been durable, retained its color even against direct sunlight each morning, and it made of solid material. So great that I purchased a second curtain a few days ago for another part of our apartment. Would recommend! Good quality fabric, well made, color not what photo represented. material was black out and thermal . I'm enjoying them. I will have to hem them because they are a little long, but that is no problem. Combined with our blue lace blinds we enjoy watching the jaws of our guests drop. Pure white, great texture. Quality product. heaving material. You cant see through. I'll buy this again. I love the fabric, the length, and the stone blue color. I was hoping to make a completely dark room, but even over blinds, they create more of a twilight feel. I steamed them and the wrinkles come out easily. Great looking, mostly dark curtains. For the cost these are awesome! Nice curtains, delivered as promised. Very happy with product. I love these curtains, they block out enough light that the room is dark but still have a glow so you can see in the day.